The manufacturer of Accrington brick is to close its Lancashire factory - leading to the loss of about 80 jobs. 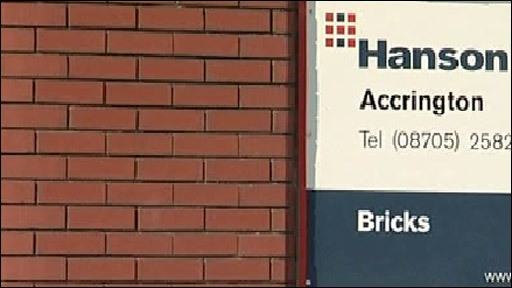 The Hanson Building Products factory in Whinney Hill Road, near Accrington, is set to close at the end of October. The company has blamed the current state of the housing market, saying demand for bricks has fallen by up to 40% in the past 18 months. A spokesman for Hanson said the firm had recently seen sales volumes drop "at unprecedented rates". "This is the furthest we've seen the brick market fall since just after the Second World War," he said. "We have had to take these measures to preserve the rest of the business. We couldn't carry on producing bricks with nobody buying them. "But there is still a massive pent-up demand for new houses, and it will come back." Hanson is now in formal consultation with workers over the closure. The spokesman said the factory would be "mothballed" with a skeleton staff, in case it were to re-start brick production there once the market recovers. The company is a subsidiary of the Heidelberg Cement Group, which employs 70,000 people worldwide.